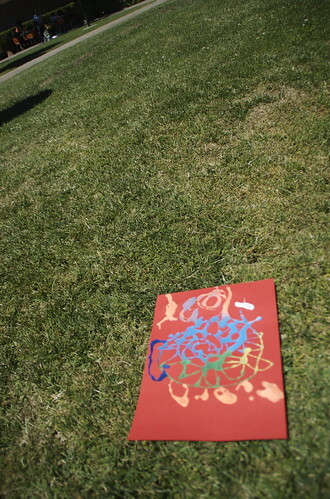 One of the activities was to draw with glue and then cover the glue with colored sands. If the kids wanted to they could also decorate with leaves & bits found in the Center’s gardens. 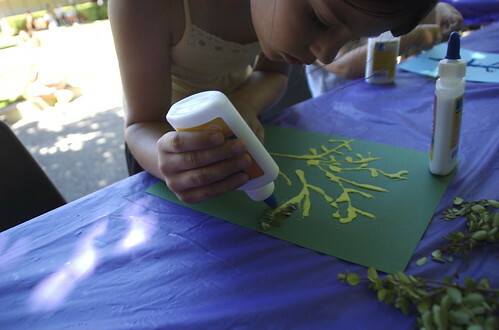 Maggie made a tree and painstakingly added small leaves one-by one to the branches. Bjørn on the other hand, made a psychedelic spiral tree in rainbow colors. The next time we head out to the beach I’m thinking this will be a fun project to do with shells, seaweed, and whatever little bits we find along the shore to make a sea-side keepsake.